Fruit and chia yogurt pudding is a light and healthy dessert to help you keep your new year's resolutions. Chia seeds are a powerful superfood that are rich in antioxidants, fiber, protein, and omega 3 fatty acids. When a chia seed gets wet, it absorbs the liquid which causes a bead of gel to form around the seed. This thickening agent is great to use in healthy desserts because it makes you believe you are eating a rich pudding when in fact you are consuming a nutritious (and mostly calorie-free) gel. Step 1: In a small bowl soak the chia seeds in the water and orange juice for 10 minutes. After 10 minutes, a chia gel should form. Step 2: Combine the chia gel with vanilla yogurt, mix to combine. Step 3: Layer the yogurt chia pudding in cups or glasses with pomegranate seeds, kiwi fruit pieces, banana, oranges, and granola in between. Segmenting is a common technique used to separate a grapefruit or orange from it's peel and pith. Step 1: Slice a thin piece of peel from both the top and bottom so the flesh of is exposed. This will give you a flat surface on both the top and bottom of the grapefruit. Following the contour and shape of the grapefruit and slice the peel and pith away from the grapefruit. Step 2: Use a butcher’s knife and move from top to bottom, ensuring that your grapefruit is resting flatly on the cutting board. Continue this process, turn the grapefruit after each slice until the peel and pith have been removed. Step 3: Using a paring knife, make cuts along the inside of the membrane into the center of the fruit. Repeat this process along the membrane found on the other side of the segment. Once you’re knife has reached the center of the segment of the grapefruit will pop free. Repeat this process until you have removed all of the segments from the grapefruit. 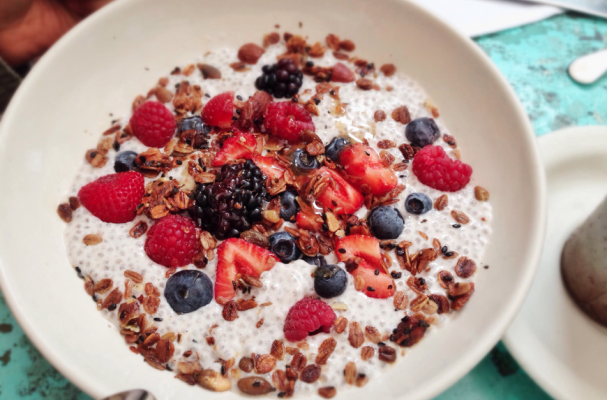 **Note: The photo used is the summer version of this fruit and chia yogurt pudding recipe. Feel free to change up the fruit based on what you have on hand or what is in season. ***Note: You can sweeten this pudding with honey or agave syrup.